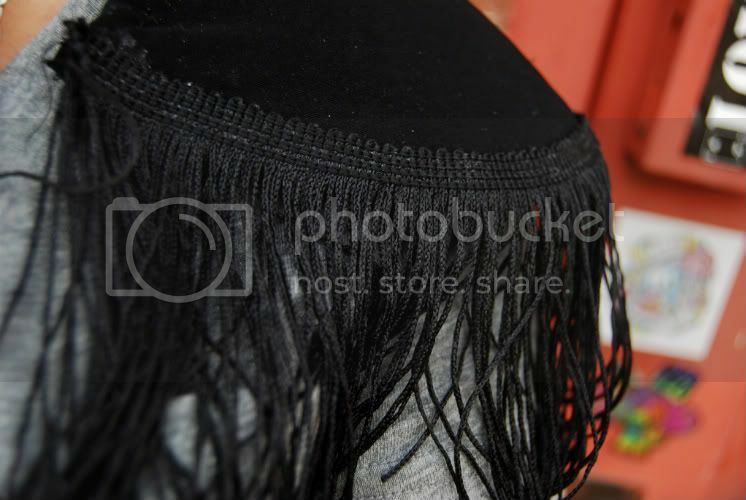 This Time Tomorrow: DIY: shoulder pad fringe! As is the case with all of my DIY posts, as long as there is glue, scissors and minimal sewing involved, I'm cool with it. This project was no different. I originally got this idea from Ms. Arabelle of Fashion Pirates, when she was sporting a similar t-shirt at the New York City Weardrobe conference. Then I also spotted it on Andy of Style Scrapbook. Enough was enough. I had to make my own. Well two shoulder pads (from an old blazer), some fringe ribbon (purchased at Wal-Mart), some glue and sewing later, I had my bold shoulder buddies. Now go get your own. Carry on. Love it! The shoulder pads totally spice up the outfit! oh neat..i want to put some on a blazer! gorgeous as alway darling, keep it up! FABULOUS! What a killer idea for discarded shoulder-pads. And it looks fantastic with those distressed jeans. Whenever I say or type, "Carry On," I can't not envision myself as Tim Gunn on Project Runway. Ooh what a great idea! I love how it turned out... love your jeans too! I was sent to you from the Damsels. ;) Very chic blog. I love the DIY shirt. So cool. I hope you are having a great week! nicely done! the end product looks great! I may just have to try it. i want the top, it's gorgeous! This look is so unique. I definitely have to try it as soon as possible. Lovee those jeans, thinking about getting a distressed pair myself! Love Love! I shall try this wknd! I love your DIY projects--simple and something I can ACTUALLY make. Love it. I like your style and I dont mean just in what you wear but how you do your diy's. I dont think its laziness at all.